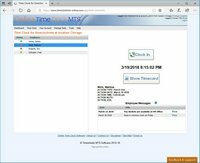 Online Time Clock MTS is a cost effective, reliable, accurate and secure replacement for your manual or mechanical time clock systems and a viable alternative to desktop software time clock systems. It can be run from all the major web browsers regardless of your computer operating system from anywhere in the world. As a web based employee time clock system it will reliably and accurately track your employee time and attendance as well as calculating overtime and employee sick and vacation accruals. It can do all of this as well as being very easy to use and administer and without you having to install any software. 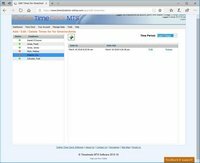 Online Time Clock MTS has been designed to be incredibly easy for employees to use, clocking in and out can comprise of just one or two mouse clicks. The training required can be delivered in a minute or two and your employee attendance data collected without adding to overhead costs but still gathered with complete accuracy. 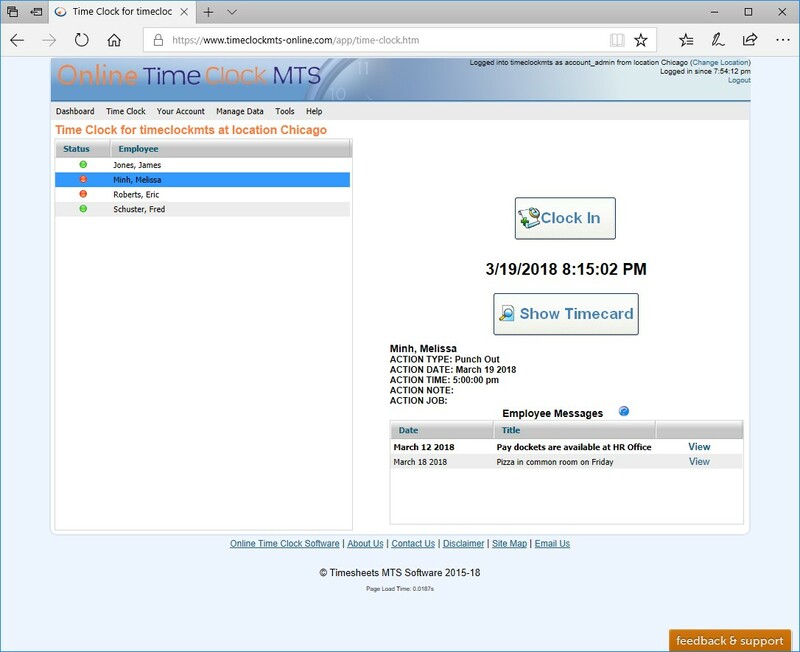 The employee time clock interface has been designed and developed over the last 5 years and used by thousands of companies (in our desktop software Time Clock MTS). It really is simple! Don't believe us? Take a look at the animated tutorial or sign up for a free 30 day trial account and try it yourself. We understand that a company time clock administrator has real world tasks that must be accomplished quickly and regularly, accordingly the administrative side of Online Time Clock MTS has been designed with this in mind. Overtime rules can be setup to meet your requirements and sick and vacation time accruals are fast to setup while being extremely flexible. Reports are generated quickly and use the latest data from your online time clock database and will give you a true indication of your employee costs and what your employees are doing right now. 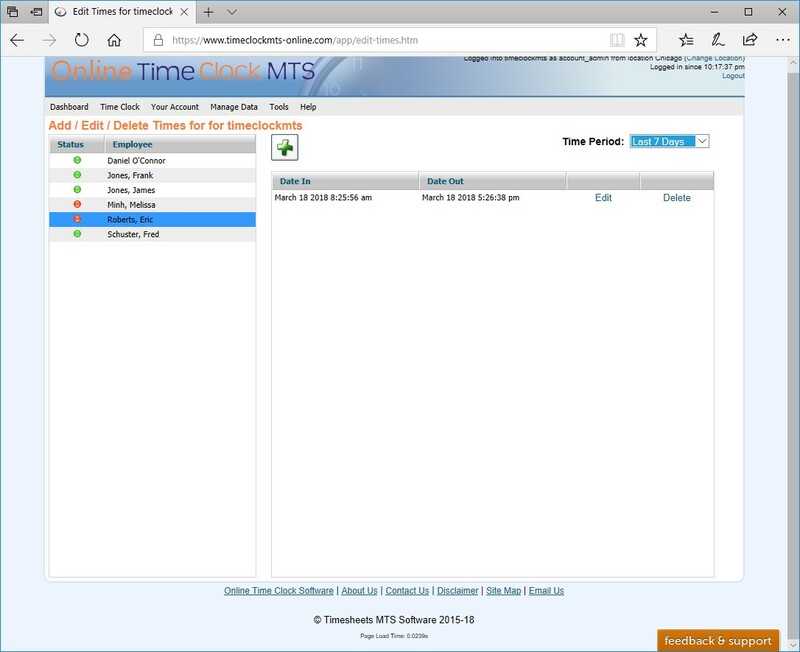 Online Time Clock MTS is a web based employee time clock system that can be used from any computer or device with a web browser and an internet connection. That computer can be anywhere in the world in any timezone and Online Time Clock MTS will take this into account when recording and reporting on your employee attendance data. Your reports are then generated from this single database, Online Time Clock MTS will save you both time and money by eliminating the need to collate attendance data, stopping data entry errors and timesheet calculation mistakes. It's been our experience in the last 5 years that a software based time clock system will realize up to 5 minutes of savings per employee per week when you replace a manual or mechanical time clock system.